Beloved and I ate at Rufo’s Famous Tapa a week ago. We were supposed to go to The Marketplace, pending a follow-up visit before we review it, only to find out that it was temporarily unavailable. Also, this was delayed because Diablo III. Anyway, since this was among the only choices at One in the morning, we decided to go ahead and try it out. The place specializes in famous Filipino ‘silogs and other strange but familiar Filipino dishes. 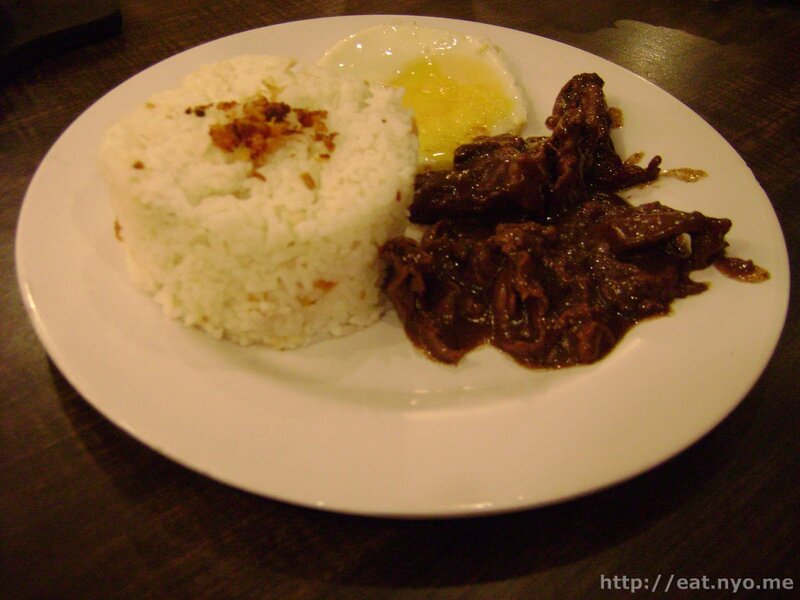 Their main specialty is their tapa, or cured beef, which is probably obvious from the name. Despite being called famous, I have actually never heard of this place before, and I decided to try out the so-called Rufo’s Famous Tapa (108 Php). Beloved had their Corned Beef Ala Rufos (75 Php) and we also ordered their Mushroom Adobo (104 Php). Finally, Beloved eyed one of their desserts and ordered it too: their Black Sambo (35 Php). This is Rufo’s Famous Tapa. It was served with fried egg and a generous serving of garlic rice. This is among the most unique tapa I’ve had—it was covered in a sauce, which tasted like some sort of liver sauce. It was devoid of the usual salty taste in cured meat, and I admit that it was actually a pretty nice surprise and goes very well with the rice. 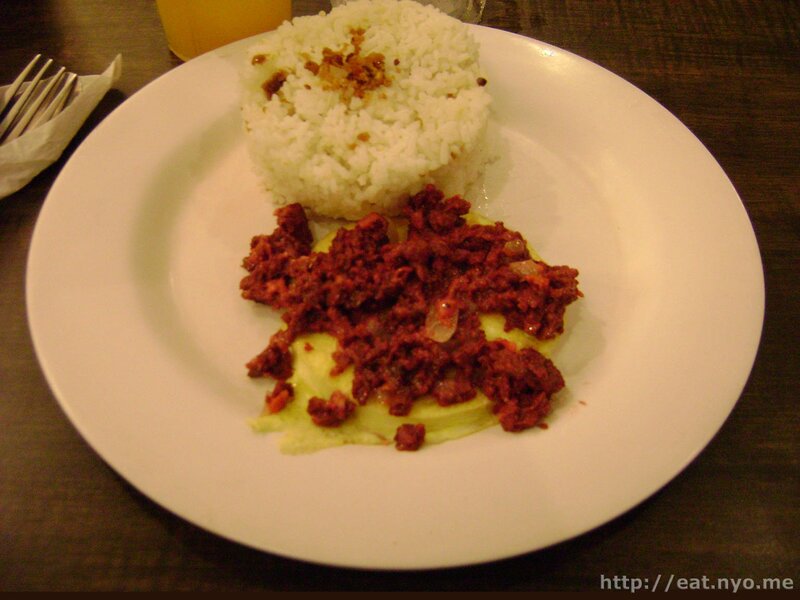 Beloved’s Corned Beef Ala Rufos was similarly served with garlic rice and egg. However, her eggs were scrambled, with the appealing red corned beef on top of it. Unlike the tapa, it wasn’t as unique over others I’ve tried, although it was also pretty good. 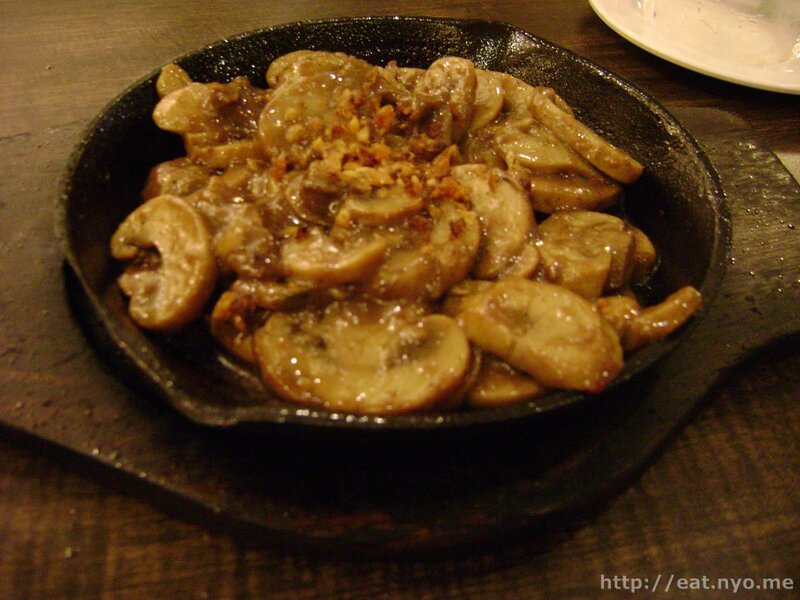 Being mushroom lovers, Beloved and I loved this sizzling Mushroom Adobo. I expected a soy-flavored mushroom stew, but it was actually not as wet as I imagined, and certainly not as salty-soy flavored. It was actually a satisfying mushroom experience, with the large button mushrooms practically dominating the sizzling plate. The only dish that did not surprise or appease us—well, Beloved, at least—was their Black Sambo. 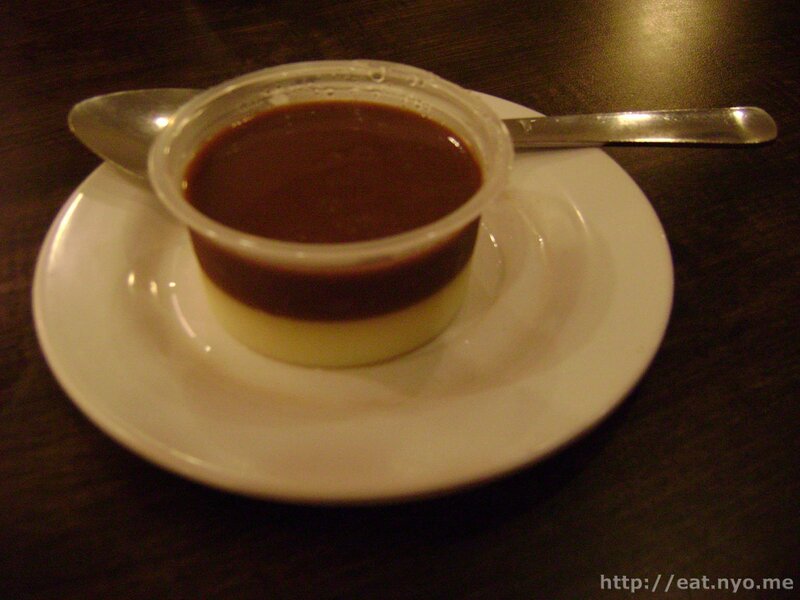 Since it was described as a chocolate-custard pudding, I think she thought that it would be very sweet. It wasn’t. It tasted like coco powder over custard in a jelly consistency. I actually thought it was decent. Beloved was disappointed. Although we weren’t able to visit what we planned to visit, our on-a-whim try at here gets above passing marks from me. The food was actually quite generous in serving and had some nice touches to them. Of course, this would not be a preference when we’re at and The Marketplace is open, but at least, being one of the few places that’s open twenty-four hours at Eastwood, it’s good to know that there’s Rufo’s Famous Tapa to go to. Recommended for: Random time ‘silog lovers. Not recommended for: ‘silog haters. Smart nomnomnom tip: Servings are pretty generous, so this would actually be a pretty good place for breakfast.